DJI is a global leader in aerial photography and cinematographers platforms. 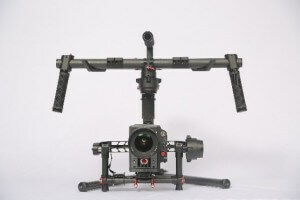 They have announced the release of their first handheld camera stabilizer. It is called the DJI Ronin. The DJI Ronin has been designed to create smooth video while retaining control over camera movements for any camera lens and combination. It supports a multitude of cameras & lenses (from Micro Four-Thirds to Red Epic sized). Using SmoothTrack technology, single camera operators can easily translate their movements into smooth gimbal movements. Filmmakers that require more precise camera movements can use a second operator to wirelessly control pan, tilt, and other gimbal functions. Or, you can attach an optional joystick to set camera angles using one operator. The DJI Ronin is easy to set up. It only requires a few minutes of calibration when changing lenses or other camera configurations. After the camera has been balanced, tap on the auto calibration button on the DJI Ronin smartphone app. The gimbal will automatically tune all stabilizing motors. This ensures filmmakers that they will get the smoothest possible footage.